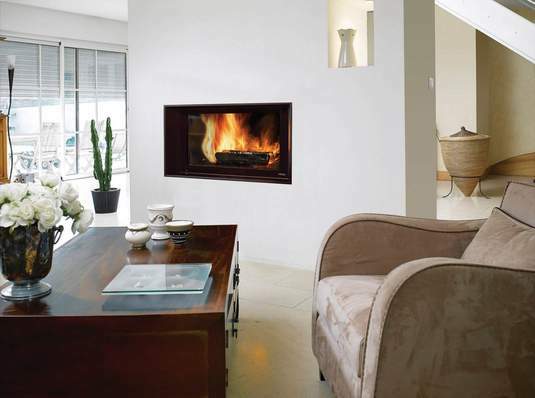 The Ulys 700 is a luxury insert stove that can give up to 13.5kW of heat. It has a large flat window with glass that extends to the edge of the door frame, and the door opens by sliding up and into the wall. Internally a clever firechamber design helps the Ulys 700 achieve efficiencies of 79% when burning wood. With the Zero CO catalyst fitted, the efficiency increases to 81% and CO levels drastically drop, as do particulates. Air ducts on top of the Ulys 700 allow hot air to be ducted to other rooms in the house. There is the ability to connect to an external air duct to supply the combustion air. The BBC version is well suited to low-energy houses.